Jill Outside: "Pain and suffering"
Today’s ride was sponsored by Tracy of Iowa, donated very generously under the heading “pain and suffering.” Geoff and I left at the crack of dawn, and by "crack of dawn," I mean it was 9:30 a.m. We cruised up the packed snow of Skyline Drive and headed for Ohlson Mountain. 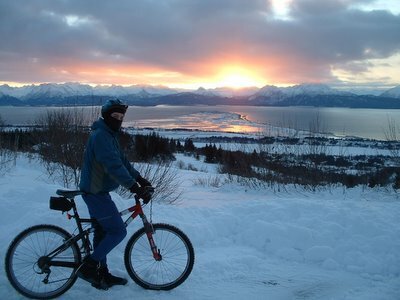 I was having a hard time keeping my eyes on the road as a blaze of sunlight erupted all over Kachemak Bay, due south above a shock of whitewashed mountains. It hasn’t snowed since last weekend’s powder dump, and we had some pretty good speed going throughout most of the hilly ride – including a 32-mile-per-hour plummet down one ice-covered hill. You can’t do that on a skinny tire … or, at least, you can’t do that and live to tell about it. I arrived home, drenched with sweat from overdressing. On this rolling glacial terrain, you can’t have it both ways – you either freeze on the downhills or sweat on the uphills. 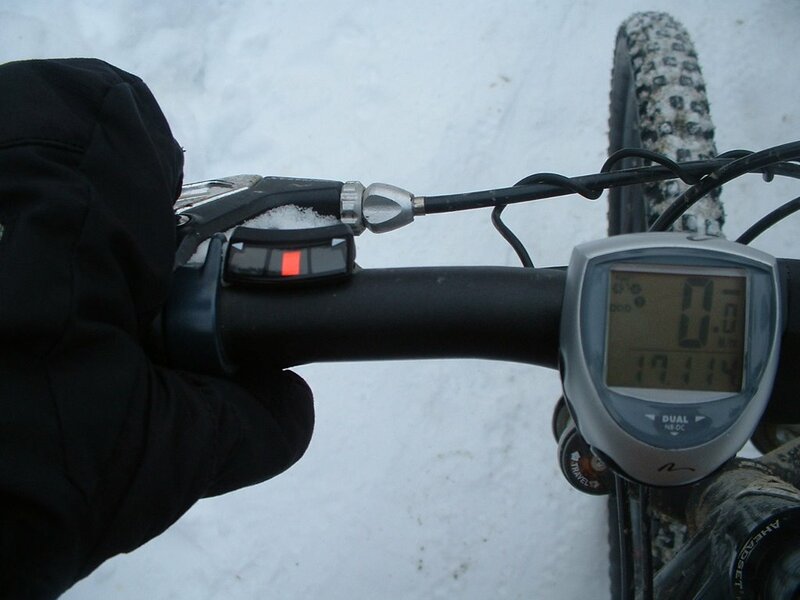 Geoff chooses to deal with the discomfort of warming up his digits after a frosty ride. I’d rather sweat a little or strip a few layers if I need to worry about being drenched on a long downhill. But either way, you learn to adjust. Eleven degrees doesn’t feel so cold anymore; the long darkness doesn’t feel like such a hindrance. We're products of our landscape, and so we move through it. Geoff installed my new bicycle computer yesterday. This is the first one I've ever owned. I always resisted computers for various reasons - partially because I like the uncertainty of free movement, and partially because I don't want to become a clock watcher, straining to beat some imaginary time or speed while breathtaking scenery disappears behind my tunnel vision. But it is nice to have; today I was able to pinpoint a turnaround spot that would get me to work by noon, and thanks to the computer I estimated my time pretty close to exact. I’ve been thinking more about my goal of riding the Susitna, and I’m feeling both nervous and excited about the prospect – a good combination, I think. I am prepared to do what it takes to get myself ready, and I really do appreciate the support. If you read yesterday's post and thought I might just be ranting again, I want you to know that I am good for every mile. I still need to tell Geoff about my plans, but I'll get around to that. He probably believes this will bring about alot more suffering than enjoyment for me, but I still feel a sense of purpose when I think about it. It gives me something to work for beyond the meager paychecks of employment and the simple pleasures of day-to-day life. Even after one day, I'm already finding support from all over. I feel like a one-woman-all-cyclists team. So, whatever happens, thank you! its a balmy 20 something here. We don't usually have snow this early in southern Iowa but its there. I am thoroughly enjoying your breathtaking photos. I appreciate your efforts. There really is more to dressing right than sometimes meets the eye. I will do just about anything not to be bundled up. Since I am always on foot or snowshoe, I don't have the mph factor that you do. But I hate the feeling of being overdressed - I need to feel light and agile (sometimes a challenge with my body shape!) I used to hate those face masks but now they are my friend and I always carry a long scarf. Watch the sweat - getting wet is very dangerous at low temps . . . and, bravo. I put my bike up in September.